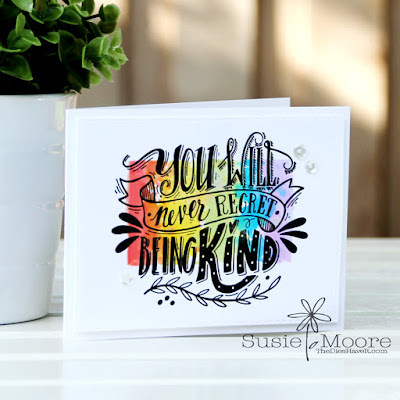 Here is my homework from day four of the Rainbow Maker Online Card Class hosted by Jennifer McGuire, Kristina Werner and Laura Bassen. Tomorrow I will share my homework from day five. Day four was all about rainbow water coloring. I am a total mess at water coloring because I can't let go of my need for control. Even here I masked off the area where I wanted my water colored rainbow to reside. I used Gina K. Designs inks to make my stripes. I love the vibrant colors in her collection. My technique is fairly simple. I just smoosh the stamp pad onto my craft mat and then add some water. A few brush strokes with my "water colors" and I had a rainbow! Once the rainbow was completely dry, I stamped my sentiment which is from Lil' Inkers Designs. A few sequins and I called it done!